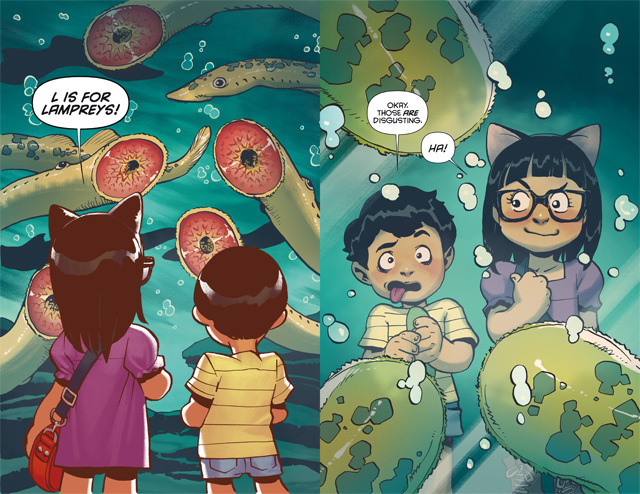 Preview Greg Pak & Takeshi Miyazawa's children's book and listen to Jane Lui's theme song. 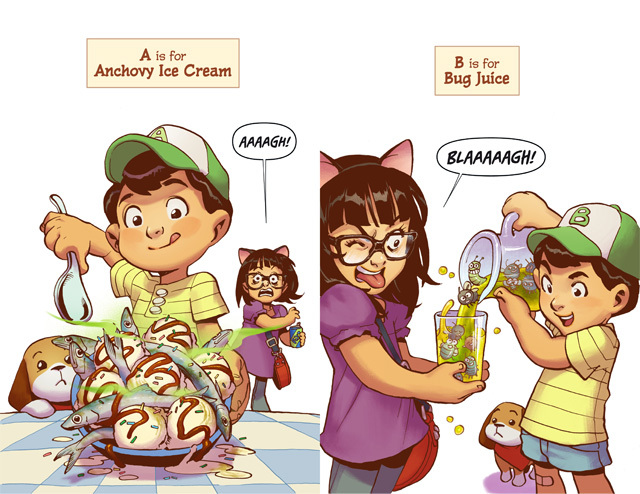 A is for Anchovy Ice Cream. B is for Bug Juice. 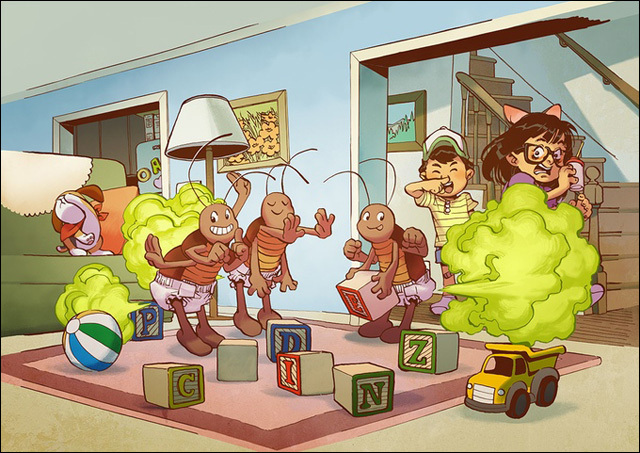 C is for Cockroaches. 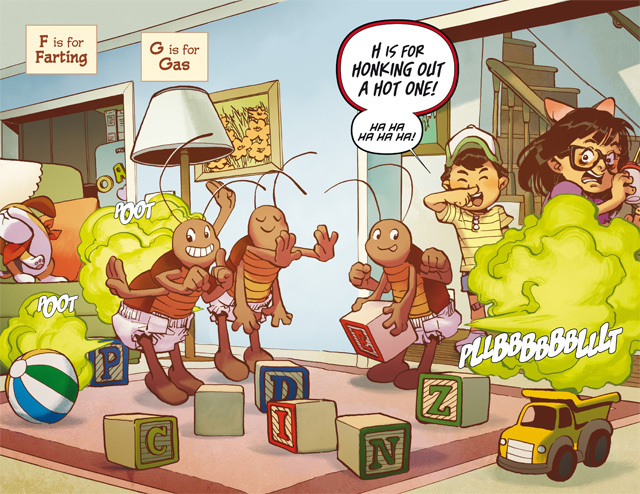 And so begins the inventory of grossness in ABC Disgusting, a unique children's alphabet book by writer Greg Pak and artist Takeshi Miyazawa. 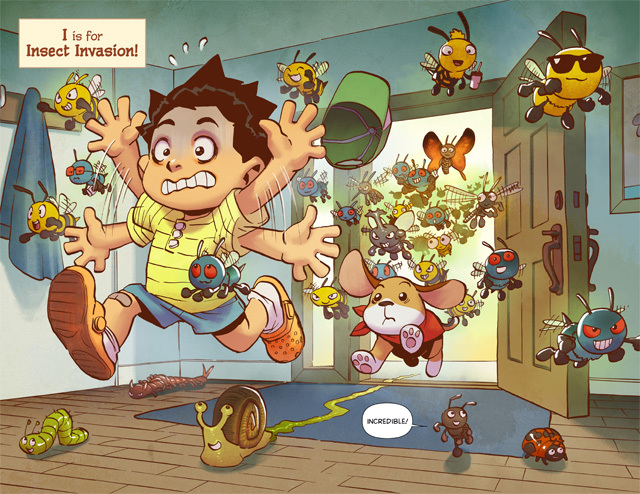 In ABC Disgusting, a boy tries to shock his sister with an alphabetical series of disgusting things -- dirty diapers, farts, insects and more! 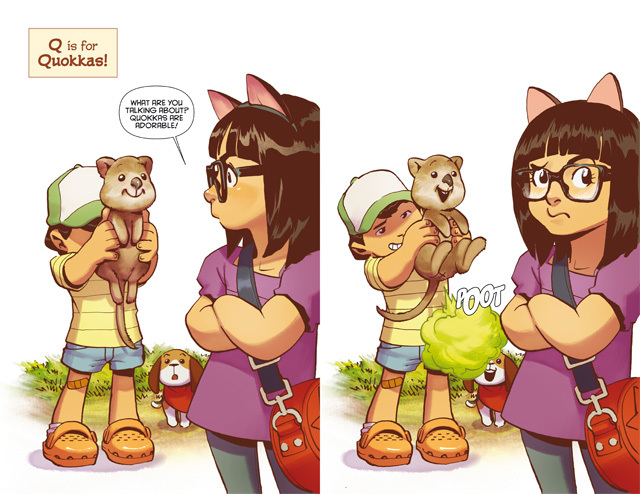 But in the end, she hits him with what might be the biggest gross-out of all. 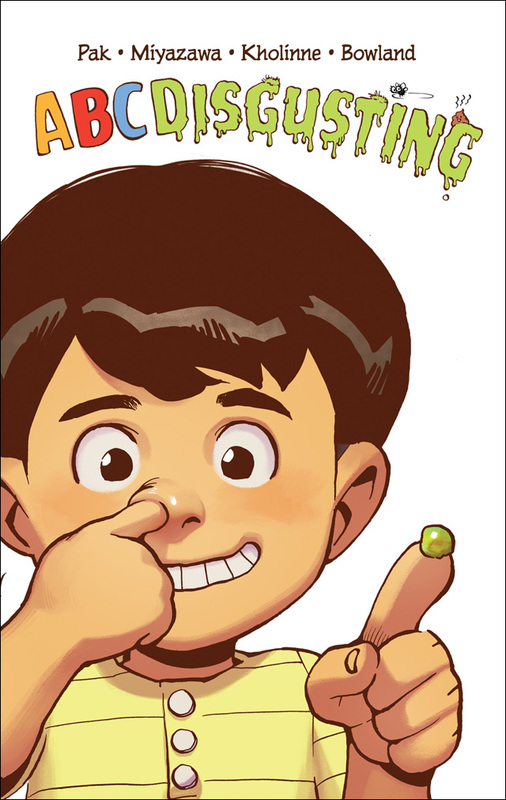 The delightfully disgusting 36-page hardcover book is available for pre-order now. 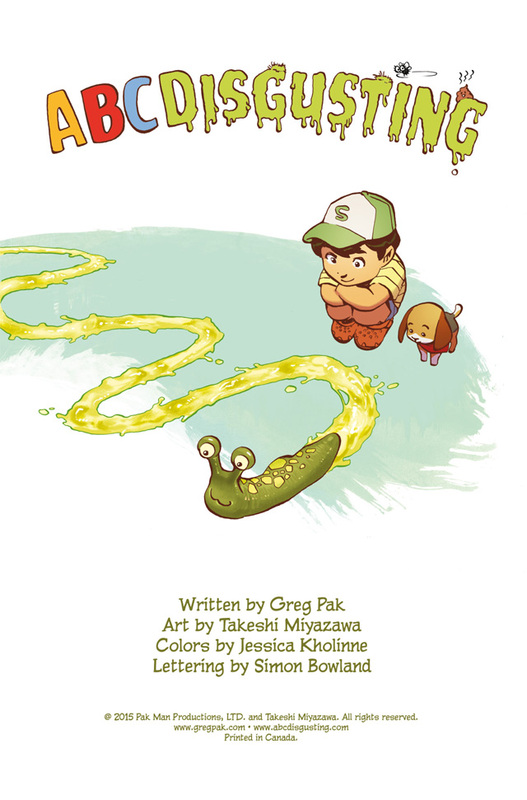 Greg says he had so much fun working with Takeshi on their previous children's book The Princess Who Saved Herself, that they were itching to collaborate on a follow-up. 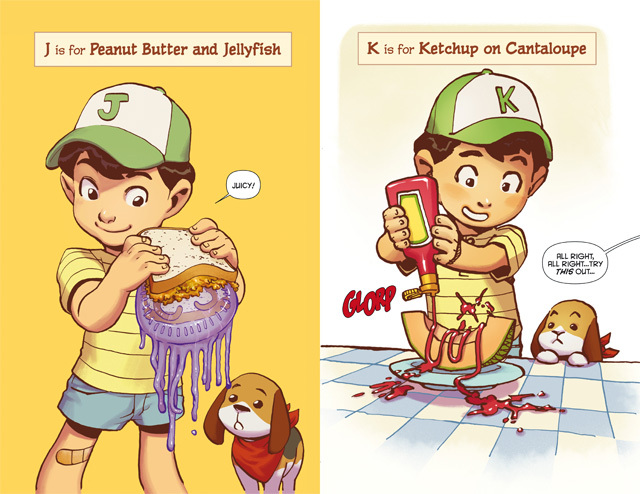 The idea for ABC Disgusting came to him as he thought about the stuff that cracked him up as a kid. "I remembered in particular grossing friends out with the idea of a mayonnaise milkshake, and I started making a list of similarly funny, gross stuff," Greg says. "And then I realized an alphabet book structure could be a great way to pull it all together." Then came the fun process of dreaming up all that disgusting stuff for every letter of the alphabet. The possibilities are endless; how do you narrow it down? Not every gross idea made the cut. "At one point 'B' was going to be for 'Bugs. And Butts. And Butts of Bugs,'" recalls Greg. "We went for 'Bug juice,' but worked farting cockroaches into the final draft, so I think it worked out okay." 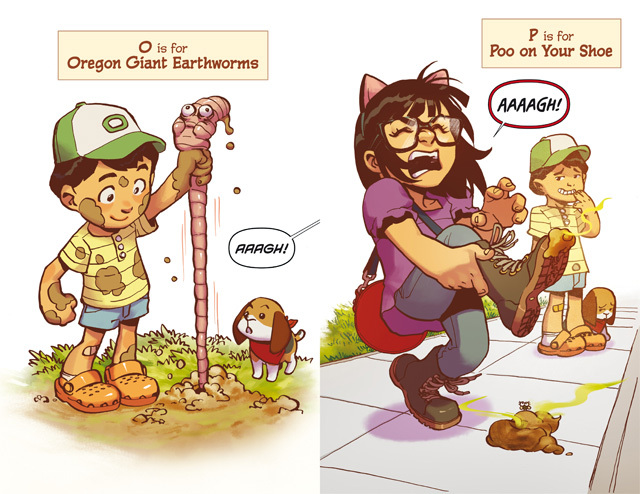 Greg and Co. launched a Kickstarter campaign to fund ABC Disgusting over the summer. The response from backers was overwhelming, and they successfully reached their $24,000 fundraising goal and then some. 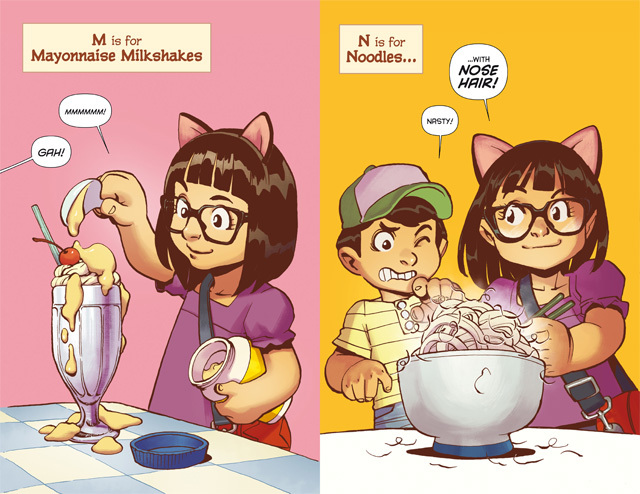 Amongst the trove of cool crowdfunding rewards, Greg enlisted the help of singer/songwriter Jane Lui to create an original "ABC Disgusting" theme song. Greg says Jane's sense of humor and quirky use of everyday sounds in her music made her a great fit to craft the tune. You can now pre-order your copy of ABC Disgusting (as well as lots of cool ABC Disgusting merchandise -- including a whoopie cushion). The perfect gift! Any orders received by Thursday, December 10 will be shipped this December. For further information about ABC Disgusting, go here.